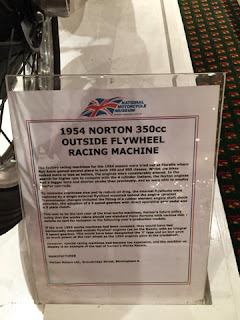 I happened yesterday to make my way up to a town called Nuneaton for work yesterday and was thrilled that it was about 30 minutes away from the National Motorcycle Museum. Of course, I had to visit. First of all, the building looked nothing like a traditional museum. There was no political gravitas nor bold nuance in the architecture to suggest that this was the home of treasured relics, let alone a public community building. Perhaps it is none of these? 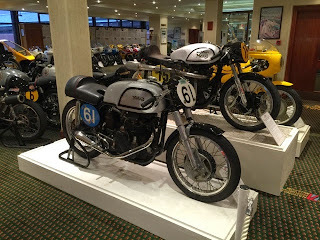 It was just a regular ole office building used to house the over 900 plus bikes on display. That said, it really was pleasant inside. I didn't miss the expected lofted ceilings et al. The reception area welcomed visitors with a few tasters of units with side cars from around the 1800's. 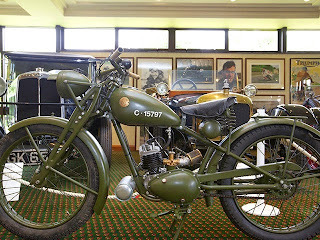 The walls were replete with photos of royalty and other dignitaries each sitting on a particular motorcycle labelled as number 61. So, I decided I had to get a photo of this number 61. No idea why it was so special. Just passed reception is a souvenir shoppe and cafe. In the same area are dozens of early motorcycles of all kinds and shapes. I thought, wow, this is not even the museum yet and there is so much on display here. 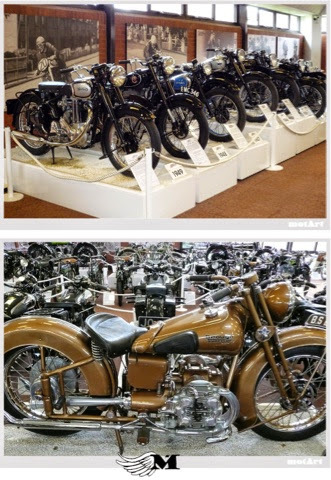 Turns out that the real museum area has five large rooms housing the 900 plus bikes. My BFF and I paid our entry fee and went it. There. Were. So. Many. Bikes! But what struck me more than anything was how defined and clear it was that what we accept today as a modern motorcycle had its beginning as an ordinary bicycle with a motor attached. Simply that. And for very many years in its evolution, it very much continued to resemble a bicycle with a motor attached. Some even maintained the original pedals. I was mostly interested in cruisers and found that there were not that many. I was also continuously on the hunt for the elusive number 61. I liked ones which had a few modification to fit one purpose or another. Others would have large farings covering the front or side complete with floorboard to resemble an early scooter of sorts. 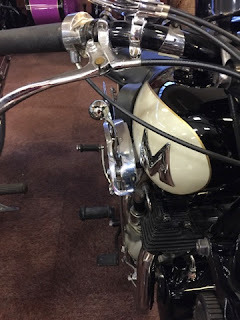 Of interest too, was the gear system used on these older bikes: quite similar to a car's gear stick. Imagine riding at high speed, and having to change gears with one hand off the handle bar! But still, after walking out the five rooms and back, we could not find number 61. So we doubled back. Still not found. We exited a bit defeated, assuming it was only brought out for photo opportunities with celebrities and the like. After we left the museum area, we browsed the bikes on display near the cafe area. They were equally very interesting. 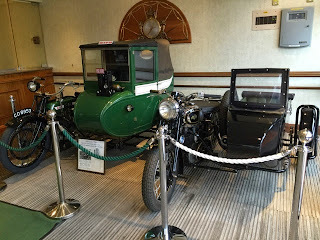 They all felt much like masses of mechanics and metal on wheels. 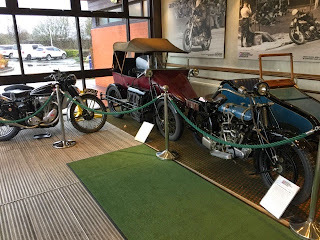 I'm guessing aerodynamics and aesthetics applied to motorcycles is a recent phenomenon, or else these all may have been 'the thing' back in the day. On the very last row, there it sat! Number 61! Who would have assumed it was right there on display in the free area? I took a few photos of it, including its description, and still have no idea why it is so special. 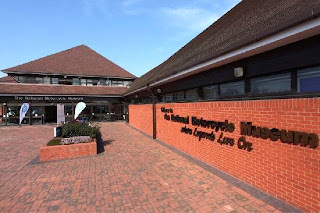 Anyway, I am very pleased to have visited and glad the museum was close by. If you're ever near the Coventry area in the UK, it's a must-visit destination. I'm the exact same as Rachel above; if my Granddad on my Dad's side were still alive, he'd love to see this place! 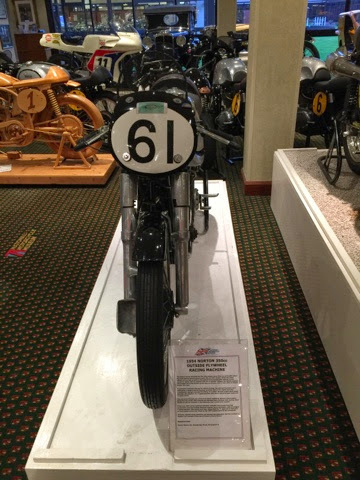 Hard to imagine with today's monsters of 1200+ cc that people actually used to race on little 350 CC bikes. Simpler times.